Associate Professor Pamela Abshire (ECE/ISR) was able to question U.S. Department of Defense Secretary Robert Gates about "deemed exports" during a speech he gave on export control reform on April 20. 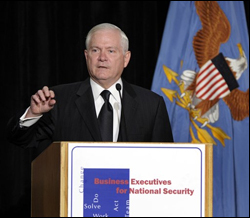 Gates spoke to the group Business Executives for National Security. Abshire is a member of the Emerging Technology and Research Advisory Committee (ETRAC) of the U.S. Department of Commerce. The 24-person committee advises Commerce on the application of export controls to cutting-edge research and innovation. You can hear Abshire’s question, and Gates’ response, starting at the 31:20 mark of the video available at the Pentagon's video channel site. On the site, search for videos on “export control” and view the video “Gates on Export Controls” from 20 April 2010. Pamela’s question comes at the 31:20 mark.